Identifying the trade in fisheries products that have been illegally caught is challenging. This article provides an overview of the solutions being developed by governments, inter-governmental organizations, non-governmental organizations (NGOs), the private sector and civil society to address illegal fishing and associated trade. Fish and fish products are among the most traded food commodities worldwide, and the trade has expanded considerably in recent decades as the fisheries sector operates in an increasingly globalized environment. The way fishery products are prepared, marketed and delivered to consumers has changed significantly, and commodities may well cross national boundaries several times before final consumption. In 2012, about 200 countries reported exports of fish and fishery products, representing about 10% of total agricultural exports, with fishery exports being valued at 129.2 billion US dollars. Developing countries account for the bulk of world fishery exports, and for many of them these exports are essential to their economies, with international and domestic fisheries trade playing a major role in job creation, food supply and income generation, while contributing to economic growth and development. The Food and Agriculture Organization of the United Nations (FAO) notes, in their report on the State of the World Fisheries and Aquaculture 2014, that one of the key issues affecting international trade in fish products is the need to ensure that internationally traded fishery products from capture fisheries (i.e. not aquaculture operations) have been produced legally. For convenience, the term ‘illegal’ when used in this article encompasses all fishing that breaks fisheries laws, or occurs outside the reach of fisheries laws and regulations. In addition, the term used by professionals, namely ‘illegal, unreported and unregulated (IUU)’ fishing is also used in this article. Illegal fishing specifically refers to fishing which is conducted by national or foreign vessels in waters under the jurisdiction of a State, without the permission of that State, or in contravention of the laws and regulations of that State. Examples of illegal fishing include fishing without a licence, fishing in a closed area or marine protected area (MPA), fishing with prohibited gear, fishing that exceeds a quota, or the fishing of prohibited species. Unreported fishing refers to fishers only reporting a portion of a catch in order to fall within quotas, failing to report the harvest of non-targeted species, or simply avoiding reporting all together. Unregulated fishing is a broader term which includes fishing conducted by vessels without a nationality, or in the area of a regional fisheries management organization in a manner inconsistent with, or in contravention of, the conservation and management measures of that organisation, and is flagged to a State not party to that organization, or not cooperating with that organization as established by that organization. Products derived from illegal fishing operations often find their way into local or international trade, thus undermining the economies of local fisheries and the supply of fish to local markets. Rough estimates indicate that IUU fishing is responsible for 11 to 26 million tonnes of fish being taken each year, with an estimated value of 10 to 23 billion US dollars. Aside from the financial losses from illegal fishing and associated trade, illegal fishing is frequently associated with a lack of consideration for working conditions, safety at sea, and labour laws in general. It is also, in some cases, linked to drug smuggling, human trafficking, money laundering, and tax evasion. IUU fishing thrives on weak governance, poor traceability, and a lack of deterrents. Traditionally, fisheries offences have not been regarded as very serious in many countries, resulting in the legislative, institutional, administrative, policy and budgetary arrangements of most States not keeping pace with the growing seriousness with which the international community now views illegal fishing and the trade in associated fish and fish products. 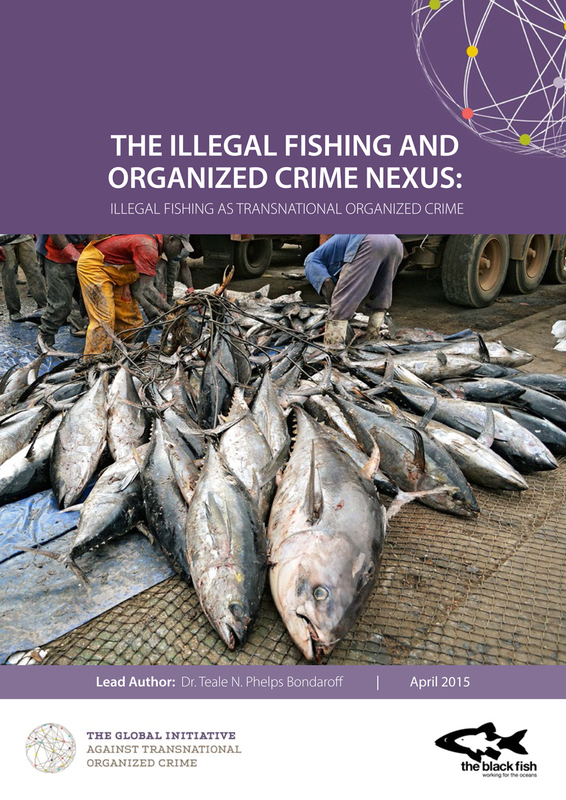 As a result, well organized and financed large-scale transnational networks are operating with relative impunity across the entire value chain of the fisheries sector, engaging in an array of criminal activities ranging from document fraud to illegal harvesting to tax evasion. Taking advantage of the limited capacity of many States to effectively control fisheries activities and associated product and financial flows, the porous nature of the prevailing international legal framework, the associated low risk of prosecution and low penalties, these transnational networks systematically divert revenue from primarily developing coastal States, and are frequently linked to organized crime networks. They are engaged in what can be called ‘fisheries crime,’ i.e. administrative and criminal offences of a serious nature carried out within, or in close association with, the fisheries sector. Identifying the trade in fisheries products that have been illegally caught is challenging. Supply chains are often highly complex, and regulatory processes generally involve paperwork rather than electronic permitting and validation systems, leaving the system open to abuse. 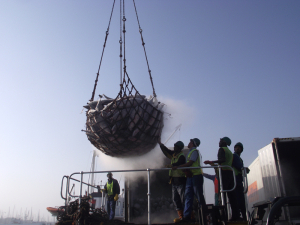 Furthermore, the international seafood trade involves high volumes of cargo and, as with all perishable goods, there is often limited time to conduct inspections at ports of entry and exit. This is exacerbated by capacity limitations for most countries, and a lack of technologies and tools – such as scanners, X-ray machines and sniffer dogs. There are challenges in information-sharing, communication and reporting between Customs authorities and other stakeholders within a country, and internationally. There is also a lack of awareness about illegal wildlife smuggling methods among the transportation sector including handling and screening companies, whose current focus is mostly on weapons and explosives. Moreover, those involved in illegal trade are adaptive, and will shift trade routes to take advantage of ports of entry and exit having weaker controls. Faced with these challenges, governments, inter-governmental organizations, NGOs, the private sector and civil society are developing solutions to address illegal fishing and associated trade. The Improvement of coordination and standardization of intelligence sharing among government agencies and other stakeholders in the supply chain at national, regional and global levels is key in tackling illegal wildlife trade. The European Union Trade in Wildlife Information eXchange (EU-TWIX) system, which has been in operation since 2005 with the ongoing support of TRAFFIC – an international NGO focusing on the trade in wild plants and animals, aims to facilitate the exchange of information and intelligence between European Union (EU) wildlife law enforcement officials across Europe. The system currently engages over 850 law enforcement officers, representing Customs, the police, the judiciary and national authorities responsible for enforcing the Convention on International Trade in Endangered Species of Wild Fauna and Flora (CITES), amongst others, from the 28 Member States of the EU and its neighbouring countries, as well as organizations such as the CITES Secretariat, the European Commission, EUROPOL, INTERPOL, the United Nations Office on Drugs and Crime (UNODC) and the WCO. Several species of sharks and the European eel (Anguilla anguilla) are currently listed, amongst a total of 103 species of marine and freshwater fish. Via the EU-TWIX mailing list and database, officials share information on illegal wildlife trade trends on a daily basis (species being traded, routes used, modus operandi, etc. ), thereby alerting their counterparts throughout Europe. No nominal information is shared when using the EU-TWIX system. Exchanges via the mailing list have, for example, helped draw attention to the illegal trade in eels (routes used, mislabelling of shipments where Anguilla anguilla is recorded as another species of eel such as the Japanese eel, etc.) and assisted officials in identifying shark products, which have led to seizures. Processed seafood products in international trade are often very difficult to identify at a species level, making implementation of species-specific legal requirements, such as those under the CITES, very difficult to implement. There is a need for training components on illegal wildlife trade to be incorporated into existing systems and programmes – to make it cost effective, and to ensure that officers are trained at the beginning of, and throughout, their careers. Many agencies, institutions and organizations, including TRAFFIC, conduct species identification training, and provide support materials such as fact sheets, posters, and identification guides. iSharkFin, an innovative tool making use of technological advances in image recognition software, was recently developed by the FAO in collaboration with the University of Vigo in Spain. Aimed at port inspectors, Customs officials, fish traders and other users without formal taxonomic training, iSharkFin allows the identification of shark species from a picture of the fin (see www.fao.org/ipoa-sharks/tools/software/isharkfin/en). Analysis of the trade in wildlife products has for some time been recognized as a valuable source of information, contributing to the effective monitoring and regulation of natural resource use and trade. Given the extent to which fisheries products are traded internationally, knowledge of the trade dynamics for these products is almost a prerequisite to good management, as it has the ability to shed light on issues such as the source, destination, value, and volume of fisheries products in international trade. determining the value of IUU products in international trade. The sourcing, extraction and analysis of trade data can be carried out by any individual, NGO, business, government agency or other institution anywhere in the world. Trade data analysis is an inexpensive process, requiring only a standard computer, Internet access, and knowledge of spread-sheet applications. There are many user-friendly websites managed by national governments or international organizations such as the United Nations which provide, mostly free, online access to trade data. TRAFFIC’s fisheries trade data analysis user’s guide – www.fisheries-trade-data.org – provides information on sourcing, extraction and analysis of trade data, and includes links to websites where trade data can be obtained. The 2012 amendments to the WCO Harmonized System saw some significant changes under Chapter 3 supporting the separate identification of certain species of fish and crustaceans, molluscs and other aquatic invertebrates. This has enhanced the possibilities for fisheries trade data analysis, and the next set of amendments, in 2017, will hopefully improve separate identification even further. Illegal seafood trade knows no borders and the freight forwarders, logistics companies, land, air and sea carriers, including passenger airlines, are increasingly being abused by traffickers in wildlife who depend on them to smuggle illicit goods from source areas to market destinations. The private sector can, therefore, play a critical role in being the eyes and the ears of enforcement agencies, helping identify and strengthen key risk points in the supply chain. However, as mentioned earlier, there is a lack of awareness about illegal wildlife smuggling methods among the transportation sector in particular, including handling and screening companies. The Reducing Opportunities for Unlawful Transport of Endangered Species (ROUTES) Partnership was established in October 2015 with a five-year mandate to collaborate and implement activities that will assist the transport sector, in an effort to reduce wildlife trafficking via land, sea and air. Funded by the United States Agency for International Development (USAID) and coordinated by TRAFFIC, ROUTES has established collaboration across government agencies, transportation and logistics industry representatives, international conservation organizations and donors to counter the use of transport supply chains for the illegal movement of wildlife by organized criminals. ROUTES complements other conservation and law enforcement approaches by focusing on private sector solutions along their supply chains, bringing the transport sector to the forefront of innovation in disrupting the illegal flow of wildlife. In its initial phase, ROUTES is focusing on the aviation transport supply chain, with the intention of expanding to the maritime sector in coming years (see www.traffic.org/routes). Pilot training courses at two airports – one in Africa and another in Asia – will take place this year. TRAFFIC has previously been involved in a number of training programmes involving Customs officials, but this will be the first one that is specifically focused on the transport sector. Is illegal fishing a form of organized crime? In which circumstances should it be treated as such? What approaches are necessary to tackle it? These are some of the main questions driving new research carried out by the NGO The Black Fish in partnership with the Global Initiative Against Transnational Organized Crime. 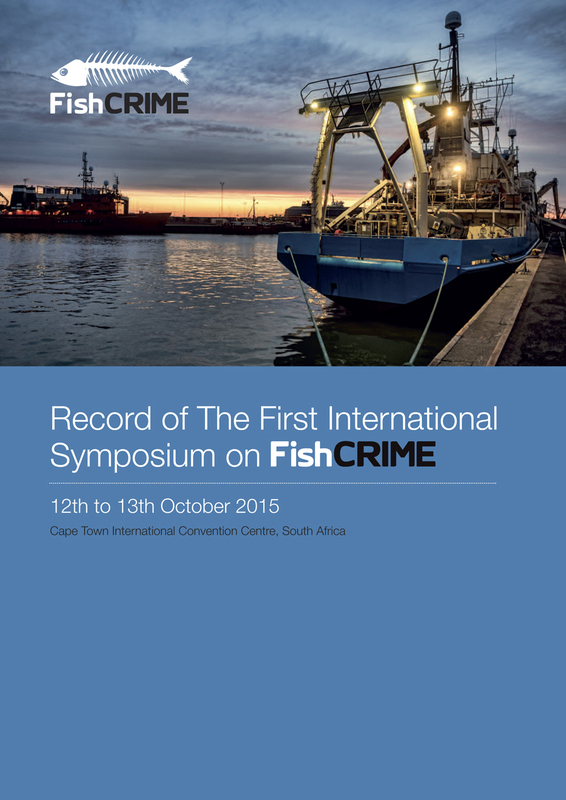 Cape Town, South Africa, saw nearly 200 delegates from 31 countries participating in the inaugural International Symposium on FishCRIME from 12-13 October 2015. The record of the meeting is available online.